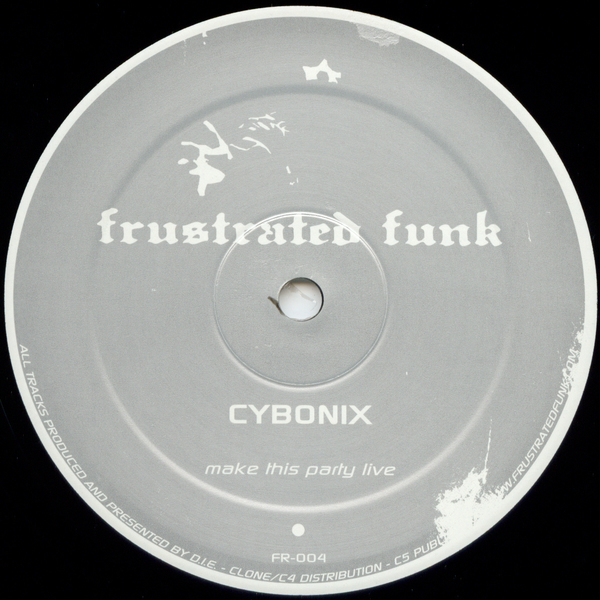 3 tracks feature on this 12" split between Clone and Frustrated Funk, all produced by Detroit In Effect (D.I.E.) woeking like a finer, more futuristic version of Detroit ghetto electro a la Electro Funk. 'Make This Party Live' is a fast and furious cut, mashed up vocals over a harsh lo-fi beat with added arpeggiators, rough sub bass and further vocals added, future ghetto styles! You could almost call it Motor City Grime. The other cuts 'Shake Your Body' and 'Let Your Body Rock' are further explorations into electro, with the same gritty aesthetic and ghetto style vocals, with the ultra stripped 'Let Your Body Rock' catching my ear. Ace old school aesthetics wrapped up in futuristic beats.